A new report from House Republicans shows a citizenship question appeared on the U.S. census in one form or another for nearly 175 years, and argues that its addition to the 2020 census should not be controversial despite Democrats’ objections. From 1970 to 2000, the long-form census—sent to a segment of the population—inquired about citizenship. Since 2005, the Census Bureau has asked 3.5 million Americans about their citizenship every year. Those census appearances cover almost 175 of the 229 years since the first U.S. census in 1790. “This report analyzes the history of the citizenship question and demonstrates that Democrats’ efforts to sow fear and controversy around its reinstatement are without any merit beyond scoring political points,” the minority committee staff says in a press release. Rep. Jim Jordan, R-Ohio, ranking member on the committee, authorized release of the nine-page report and appendix. 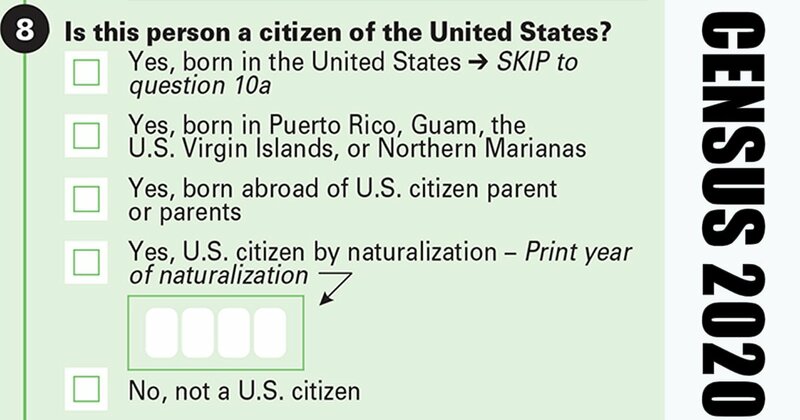 Mike Gonzalez, a senior fellow at The Heritage Foundation’s Allison Center for Foreign Policy, said 1950 was the last time the government asked the citizenship question on the “short form” census that goes to all American households. After 1950, the citizenship question “migrated to the long form that went to a select group of households,” Gonzalez said. “When the long form was replaced by the American Community Survey—which is sent every year to about 3.5 million households across the country—in 2006, the question then migrated to the ACS,” Gonzalez added. The long-form questionnaire “provides socio-economic detail needed for a wide range of government programs and federal requirements,” according to Census.gov. The Supreme Court will hear arguments this month on including the citizenship question in the 2020 census, bypassing an appeals court hearing, with a ruling expected in June, The Daily Signal previously reported. Congressional Democrats have fought Commerce Secretary Wilbur Ross on his decision to restore the citizenship question to the census. Some, including Rep. Elijah Cummings, D-Md., chairman of the Oversight and Reform Committee, have called the citizenship question unconstitutional. The report notes that Rep. Michael Cloud, R-Texas, addressed the constitutionality question with Ross during the March hearing. The report from committee staff “demonstrates that we’ve had a long history of asking a citizenship question on the census and the claim that it is somehow unprecedented or unconstitutional has no basis in fact or law,” Hans von Spakovsky, a senior legal fellow at The Heritage Foundation’s Meese Center for Legal and Judicial Studies, told The Daily Signal in an email. U.S. Citizenship and Immigration Services requires each prospective employee in the United States to submit an Employment Eligibility Verification Form (I-9 form), which asks about the person’s citizenship status. The District of Columbia solicits citizenship status for individuals applying for a driver’s license. Wisconsin requests citizenship status for those applying for a driver’s license. California asks about an individual’s citizenship when he or she applies to obtain a firearm. Ohio requires an applicant for a concealed carry license to state his or her citizenship. A question about citizenship on the census shouldn’t be remotely controversial, Gonzalez told The Daily Signal in an email. A republic should not take account of any other category, whether racial, ethnic, or sexual, when it considers rights and responsibilities. Citizenship bestows rights and responsibilities, and citizens vote in governments. Why anyone would want to ask questions on race and ethnicity in the census, but fear questions on citizenship, is beyond belief. Rachel del Guidice is a reporter for The Daily Signal. She is a graduate of Franciscan University of Steubenville, Forge Leadership Network, and The Heritage Foundation’s Young Leaders Program. This article originally appeared in The Daily Signal and is reprinted by permission. Obama May Be Importing Radical Islamists Into the U.S.